"SteriGuard™ Anti-Microbial Wiring Devices provide excellent protection against the growth of microbes on all surfaces. Independent testing proves the ability of these devices to inhibit the growth of Escherichia coli, Gram (-) and Staphylococcus aureus, Gram (+) providing long lasting benefits to manufacturers’ beyond conventional cleaning methods. 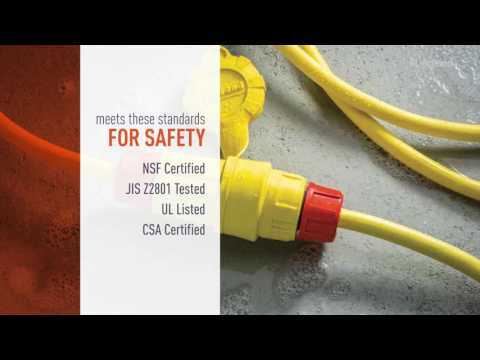 Rated watertight for 1,500 psi high-pressure hosedown, these plugs and connectors feature multiple seals to ensure protection against the environment. SteriGuard provides a cost-effective way to add additional safety precautions and unequaled assurance that every feasible step has been taken in the interest of consumer protection. " Steriguard™ Anti-microbial Wiring Devices are ideal for a wide range of applications including food and beverage preparation, procession, & packaging; agriculture, pharmaceutical, and health care.